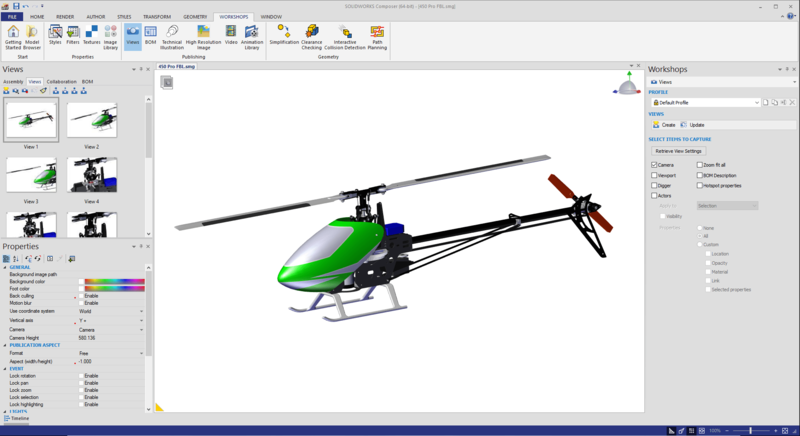 Creating Views is core functionality of successfully using SOLIDWORKS Composer. These “Normal” Views capture all properties of nearly everything in the Viewport. Actor position, color, visibility, render mode, camera position, and the list continues. What do you do when you don’t want or need to capture everything in the Viewport? 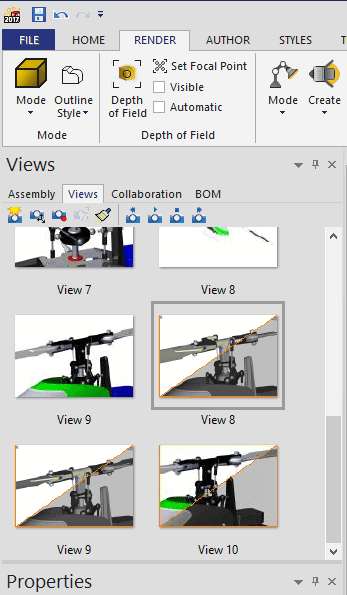 The answer is the Custom, or Intelligent View, accessed through the Views Workshop. 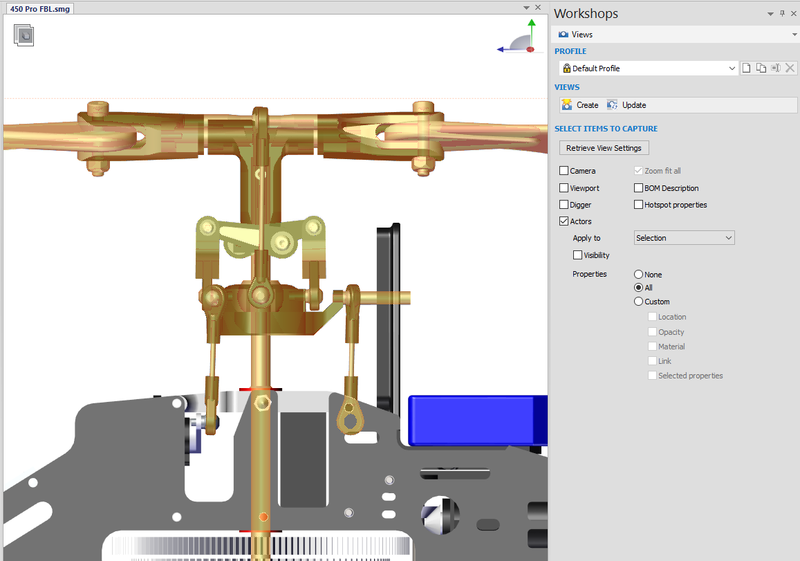 The View Workshop gives the user complete control of capturing only the property(s) they need based on several different settings. For example, if I only want to capture the location of a group of actors, this is the tool to use. You’ll now have a view, or several views, in the View Pane that will have a diagonal line though it with some darker shading on the bottom half. See Views 8, 9 and 10, these are your Custom Views. Whenever you select a Custom View, only the selected properties will change, no others. You could use this Custom View to update the actor positions in another “normal” view while maintaining all the existing properties of that view. In the example below, I have one Custom View that changes the blade pitch and another that sets it back to zero. As the Custom View is dragged into the Viewport, only the actor position is updated. Another very useful function of the View Workshop is capturing a Camera View. A Camera View only captures the position and distance properties of the camera. These are quite useful for capturing a specific orientation and applying it to an existing view so all the images have the same look to them. 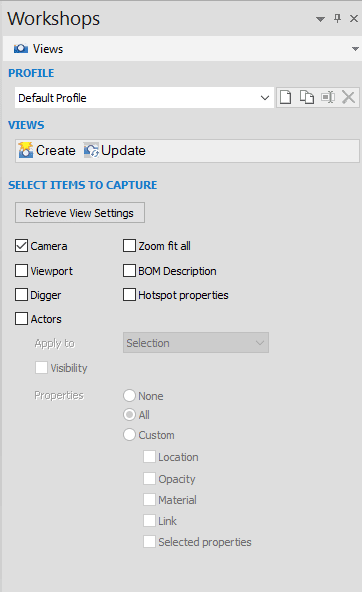 There is also a button on the main View Pane to quickly create these Camera Views. I hope you can see that there’s more to Composer that just capturing a regular view. Custom views really unlock a great deal of flexibility when working with a Composer project. They’re one of my favorites and I hope they’re useful for you.